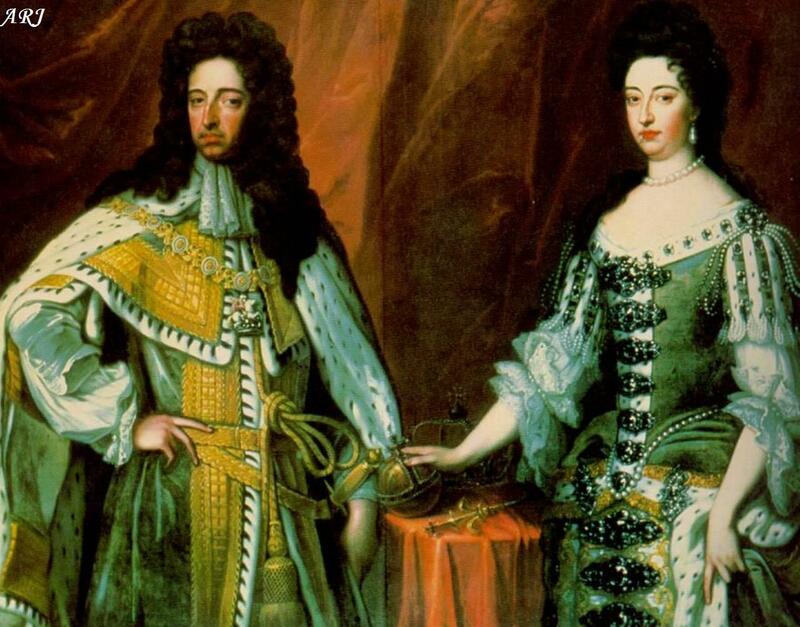 William and Mary’s reign is unique because they were both co-regnant Monarchs with equal powers and prerogatives, and not a Monarch and his/her Consort. Before 1689, the closest precedent in England for such an unusual arrangement was the joint reign of Mary I of England and Philip of Spain. Back then, Mary I’s husband had been declared King of England with almost all the powers and prerogatives of a Monarch; it was actually an act of treason to deny his authority. William III also derived his powers from his wife and reigned jure uxoris (in right of the wife). However, there were important differences between William and Philip’s situation. Philip could only reign for the duration of his wife’s reign: in case of her death or a divorce, his reign ended (he stopped being a King of England as soon as Mary I died and Elizabeth I ascended to the Throne). William was a reigning Monarch in his own right and would continue to rule until his death. The other difference was that Philip was not in command of the English Army; according to the marriage treaties, England was not bound to provide assistance for Philip’s wars (a condition that was quite futile because Mary I always supported her husband’s campaigns which eventually cost England the port Calais). William had all the powers and prerogatives an English Monarch could have. Perhaps more crucially, in the event Mary II predeceased him, his children from a possible subsequent marriage were given succession rights. Now, a little information on how things came to that in the first place.